A suspect package found at a post depot in County Limerick appears to be identical to explosive packages found in the UK earlier this month, gardaí (Irish police) have said. Irish Defence Forces said a "viable improvised explosive device" had been found contained in a plastic envelope. On 5 and 6 March, devices were received at addresses in London and Glasgow. Responsibility was claimed by a group calling itself the IRA. The caller, who used a recognised code word, claimed five devices had been sent, but only four had been discovered. On Friday, gardaí said they received a report of the package at an An Post office on Dock Road at about 06:00 local time. Speaking on RTÉ's Today programme with Sean O'Rourke, Irish Minister for Justice Charlie Flanagan said the incidents in the UK were the result of heightened tensions in Northern Ireland due to uncertainty over Brexit. He said the sending of such devices was a "totally unacceptable act". 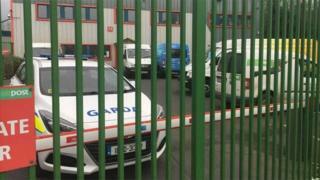 The Limerick post office was evacuated and the army Explosive Ordnance Disposal (EOD) team were notified. Post office staff contacted police after the package was discovered and up to 100 staff employed at the sorting office were moved out when the alert was raised, RTÉ reported. The packages that arrived at Waterloo railway station and offices at Heathrow and London City airports on 5 and 6 of March were posted with Irish stamps and had Dublin as the return address, prompting Irish police to join the investigation. In a statement, a spokesperson for the Metropolitan Police said it was keeping "an open mind" as enquiries continue. "We are aware that those claiming responsibility have indicated five devices were sent. At this time, only four devices have been recovered," the statement said. "Extensive advice has already been issued to relevant businesses and sectors to be vigilant for and report suspicious packages to police. This advice was previously sent to armed forces personnel and is being reiterated again in light of this claim." Who are 'the new IRA'? The parcel bomb incidents came almost a year after MI5 downgraded the threat posed in Britain by Irish republicans. It is currently classified as "moderate", meaning attacks are possible, but not likely. In Northern Ireland, the risk is greater, exemplified by a car bomb which detonated in Londonderry in January. All the attacks were claimed by an organisation calling itself the IRA. It is often referred to as "the new IRA", to distinguish it from the group which was active in Northern Ireland's troubles. It is comprised of dissidents who never accepted its namesake's ceasefire more than 20 years ago. Police on both sides of the Irish Sea have mostly been able to contain its threat. They have described it as "a small" organisation, perhaps with 50 or so actively engaging in terrorist activity.